Photos are not allowed in Macau casinos. The photos on the following pages were provided for press usage by the nice folks at Crown Macau's parent company MelcoPBL. And boy oh boy what a casino this place is! Frankly words just wouldn't/couldn't do it justice. The five or so floors of Crown Macau's casino are each decorated quite differently, but all have a similar aesthetic, which could possibly be classified as '60's Shag meets Buck Rogers'. Ceilings are decorated with generous amounts of crystal chandeliers which feature beaded drop strings and crystal light spheres. Overall, the gaming areas are quite bright, the opposite of how most casinos prefer to light their casino floors. 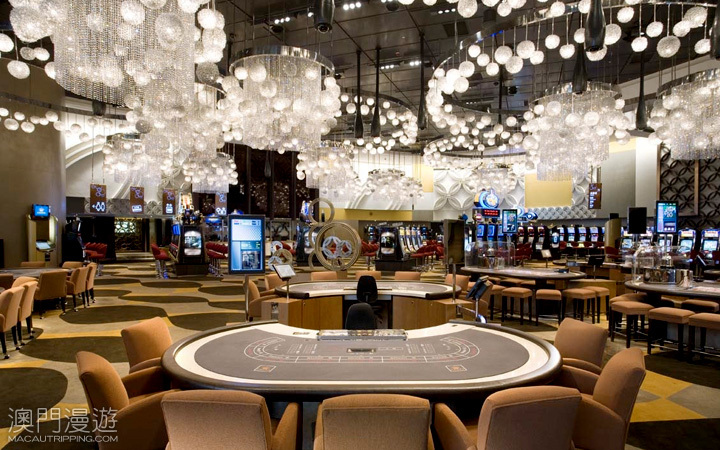 If I were to make one suggestion to Crown Macau's management, it might be to set the dimmer to 60% of what they've got now, or get some softer bulbs in there. Yes, its a gorgeous casino, but lower lighting is infinitely more comfortable, particularly if you're going to spend an hour or ten gambling. Don't believe me? Go to Wynn Macau and walk around the casino. If the lighting were lower, one might also not notice the black painted drop ceilings. New York-New York casino in Las Vegas also has black painted drop ceilings and their cheapness has always bugged me to death.